Why do I love Notton shoes? Because they reflect the personality of the woman, strong and with enthusiasm for the day to day, and also in this model of buckle the visual effect is not radical or aggressive, its apparent simplicity enhances any look. By buying this product you can collect up to 595 loyalty points. Your cart will total 595 points that can be converted into a voucher of 4,76 €. This season the idea of perfection comes with the latest model of Notton, soft patent leather, comfortable wedge and original buckle motif surrender to your feet. discover them! an as original model, needed a different color that present it in grey tone of patent leather, a finishing Galactic to keep our feet on the ground. exterior this buttoned shoe manufacturing has been used patent leather of great quality and softness. With micro-hypoallergenic fiber lining and 100% breathable and the area of the fingers in the textile to offer greater flexibility. The template is anatomic and removable, this lined in micro fiber textile and you can exchange it with custom templates. Buckle with Velcro to this sneaky with buckle, easy donning and doffing and very original. Has toe rounded and slightly stylized to give a feminine and elegant finish. Sole is two-tone ribbed rubber and this completely stitched around the shoe, also has wedge of 4.5 cm. and Platform 2.5 cm. 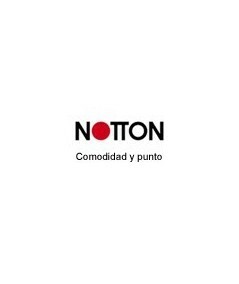 Designed and manufactured in Spain by Notton. Elegant simplicity in the new collection of Notton, and a safe choice for walking 24 hours 7 days a week.